“Peter walks on water” as portrayed by Fairview Church, Letart. 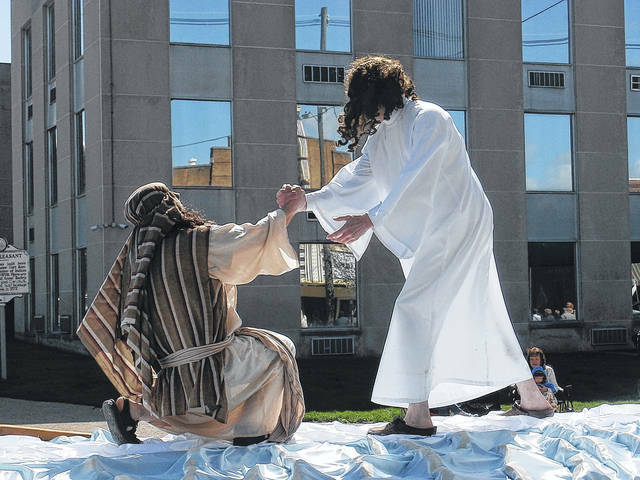 POINT PLEASANT — One of the most unique parades in the area will return this month, presenting a panoramic view of the Easter Story by local churches. 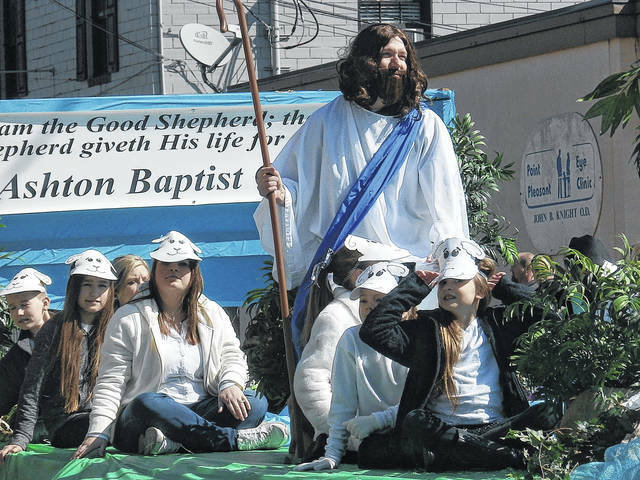 The annual Mason County Easter Parade, which portrays the life of Jesus Christ from birth to ascension, takes place at 11 a.m. on Saturday, April 13 on Main Street in Point Pleasant. The parade is sponsored by the Mason County Teens for Life group and includes those local churches creating floats and walking, living dramas to portray the life, struggles, death and resurrection of Jesus. Journey to Bethlehem, Salem Community Church, West Columbia; Nativity, Leon Methodist, Leon; Singer Randy Parsons, Oma Chapel Church, Leon; Wise Men Still Seek Him (The Magi), Heights UM Church, Point Pleasant; John Baptizing Jesus, Pleasant Valley Church, Point Pleasant; I Will Make You Fishers of Men, Trinity UM Church, Point Pleasant; Sermon On The Mount, Presbyterian Church, Point Pleasant; The Miracles Of Jesus, LifeSpring Community Church, Point Pleasant; Jesus Calms the Storm, Community United in Christ Ministry, Point Pleasant, (Music); Jesus Feeds 5000, Gospel Lighthouse Church, Point Pleasant; Peter Walks On Water, Fairview Church, Letart; Lazarus Come Forth, First Baptist Church, Mason; Jesus, The Good Shepherd, Ashton Baptist Church, Ashton; Singer Kaylee Weaver from Presbyterian Church, Point Pleasant; Let the Little Children Come Unto Me, Good Shepherd Church, Flatrock; The Triumphal Entry (Palm Sunday), First Church of the Nazarene, Point Pleasant; Jesus Drives the Money Changers out of the Temple, Harvey Chapel Church, Leon; singing from Family Student Ministry, Point Pleasant Church of God Youth; Last Supper, College Hill Church, Crab Creek; Garden Of Gethsemane, Maranatha Cornerstone Church, Letart; Jesus Before Caiaphas, Point of Faith Church, Point Pleasant; Jesus Before Pilate the Governor, Point Pleasant First Church of God, Point Pleasant; Jesus, Mocked, Robed, Crowned, Faith Baptist Church, Mason; Jesus Carrying the Cross, Jackson Ave Baptist, Point Pleasant (this will be portrayed on the ground not on a float); Jesus Being Nailed to the Cross, Bruce Chapel Church, Gallipolis Ferry; soldiers on horseback, Point of Faith Church, Point Pleasant; Crucifixion, Main Street Baptist Church, Point Pleasant; Burial of Jesus, New Hope Bible Baptist Church, Point Pleasant; Resurrection Praise Float, Fisherman’s Net Ministries Children’s Choir; Resurrection of Jesus, Grace Baptist Church, Point Pleasant; Singer Brandon Sweeney, New Hope Bible Baptist Church, Point Pleasant; Ascension,Creston UM Church, Leon; Singer Jimmie McKnight of Dunbar. An invitation to participate in the Easter Parade is still extended to churches and ministries, also local 4-H groups, sports teams, pageant queens, marching groups, etc. Interested Biblical participants contact Denise Bonecutter at 304-593-6939, non-Biblical participates contact Wayne Sanders at 304-812-8132. There are still opportunities to help bring this story to life.